My new laptop allows me to shut down for the night with webpage tabs still open. At first, I thought this was great - I could read things at a more leisurely pace and not worry I'd forget about a new post, or hot article. But now, mid summer, when the last thing I want to do at the end of a work day is face my computer, I find myself struggling to keep up with all of my favourites, leaving 20+ tabs looming week after week. It sounds ridiculous to say that I feel stressed about having too many blogs to read, but that's how I feel. The blogger community is one that I feel very lucky to be apart of, and a huge part of that is reading, commenting, liking, and supporting one-another. I got through a handful of them this weekend, more coming up this week. Baby steps, right? We celebrated 4 years yesterday, and though we had a celebratory dinner planned, breakfast needed to feel a little special too. 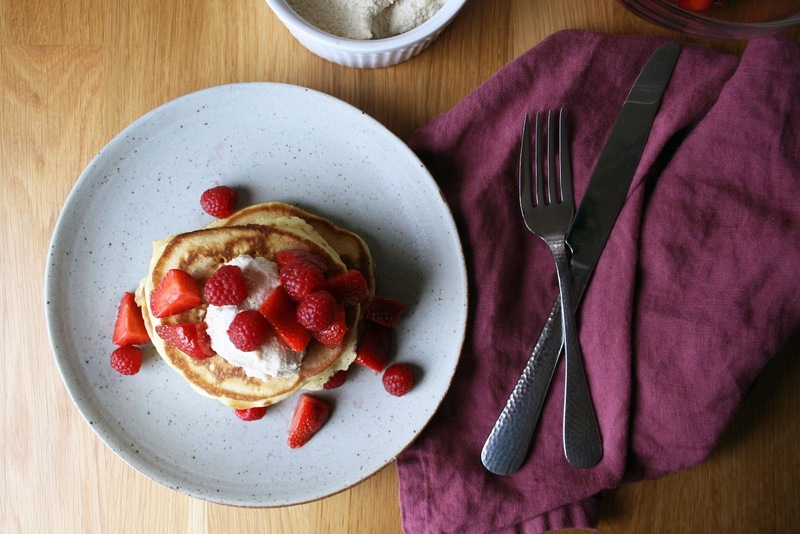 These pancakes, doused in all the summer berries, just felt right. 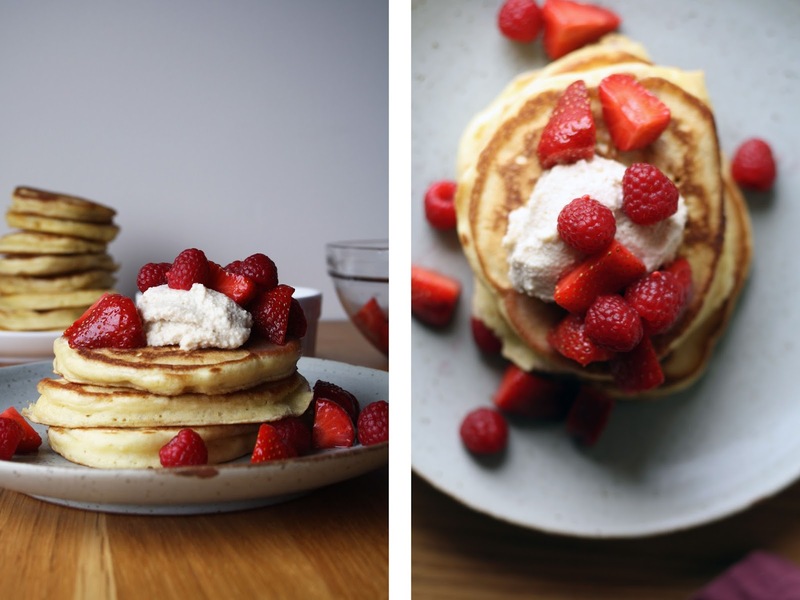 These pancakes have been my go-to fluffy weekend white pancake for some time now. Last weekend, I made these with 1/2 cup fresh blueberries folded into the batter, and they were divine. If you're a crowd, the recipe doubles effortlessly. To a glass measuring cup, add 1 T vinegar. Fill to the 1 cup mark with almond milk. Whisk and set aside. Whisk the egg into the buttermilk. Pour the wet mixture over the dry, and stir with a fork to combine. You want to quickly eliminate all visible dry bits, so the batter stays fluffy. Bubbles are a good sign, and a few lumps are okay. Let the batter rest for 10 minutes. Stir the strawberries and sugar together. Set aside. 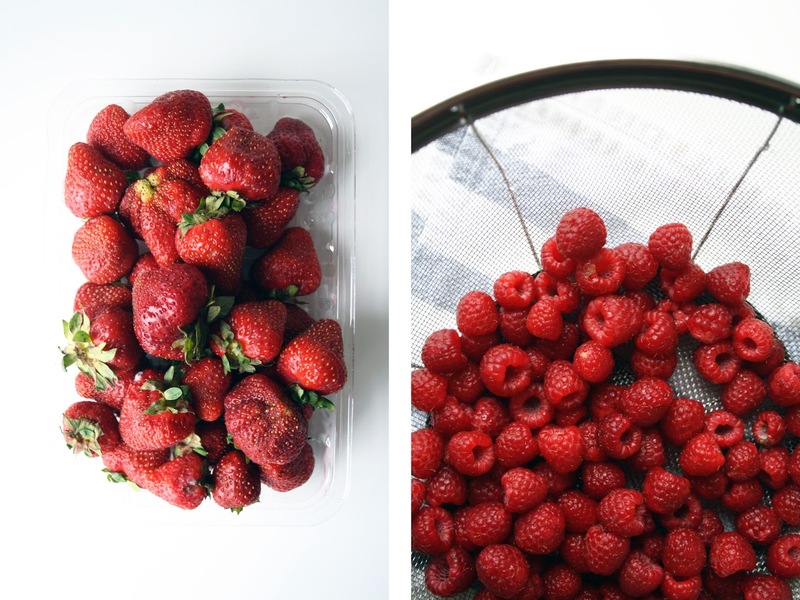 Wash the raspberries and set those aside too. Preheat the oven to 200 and place a baking tray or wire rack inside. Set a pan on the stovetop to medium heat. Brush or swirl a nub of butter or oil into pan to evenly coat the pan. Using a 1/4 measuring cup, scoop the batter into the pan. I was able to fit 3 pancakes at a time. 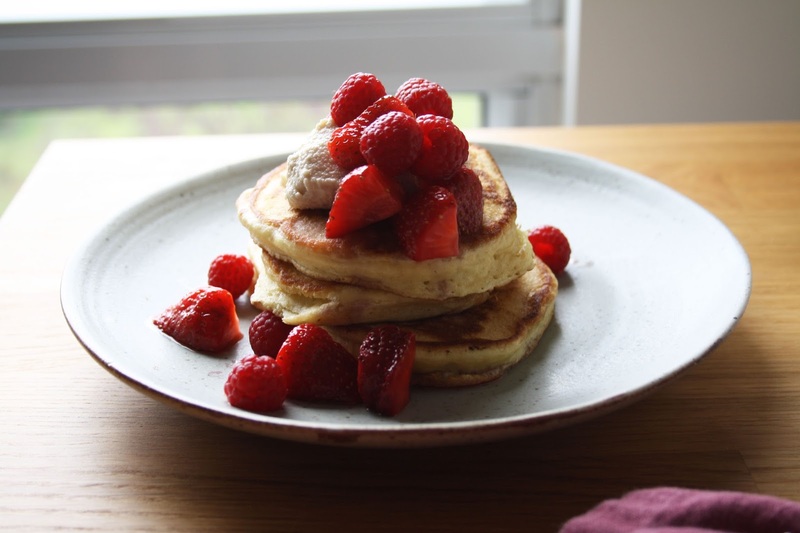 Once bubbles begin to form, flip the pancakes and continue to cook for another 2-3 minutes, until set. Keep warm in the oven while you continue with the rest of the batter, adding more butter/oil each time. 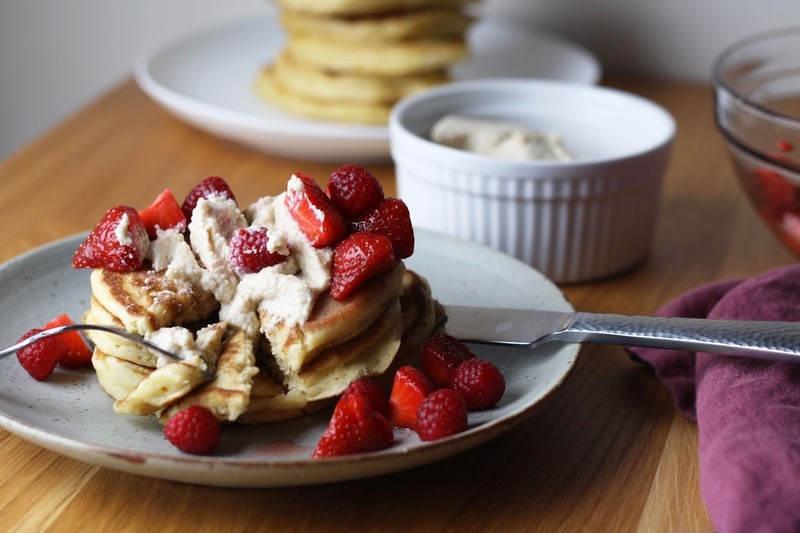 Serve the pancakes warm, topped with cashew cream, fresh berries and a drizzle of maple syrup. Adapted from i am a food blog.